The Asia-Pacific region has made considerable progress towards the Millennium Development Goals (MDGs). The rapid economic growth achieved in many countries of the region has helped lift millions of people out of poverty. Governments have made substantial investments in education and health services and in protecting their most vulnerable people. Nevertheless, the region is still off track on many crucial MDG indicators, including child and maternal mortality. In many countries, economic achievements have also had environmental costs. The situation could deteriorate further as countries put greater pressure on their natural resource base, which could undermine many existing MDG achievements. 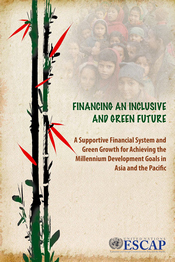 Moreover, the lack of environmental sustainability can increase the economic vulnerability of the region, including in terms of energy and food security, as experienced with the food and fuel crisis in 2008.
Financing an Inclusive and Green Future considers the challenges the region faces for achieving these Goals and shows that they are still within reach, given sufficient determination and financial resources. It starts by estimating the financial needs of the region for closing the gaps in achievement of the MDG targets and identifies potential sources for those funds at national, regional and international levels. It also shows how Asia and the Pacific can take the lead in developing a more inclusive and development friendly financial system that will reach out to the millions of ‘unbanked’ – providing them with the opportunities and security of a well functioning financial system. Finally, the report discusses challenges -including technology and finance- for promoting growth that is both inclusive and sustainable –green growth- that will help the region achieve the Millennium Development Goals.